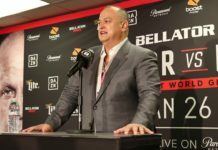 Bellator 214’s Aaron Pico admits his debut loss forced a quick adjustment. Now, he’s excited to be sharing a card with the legendary Fedor Emelianenko. Los Angeles, CA — Aaron Pico was not supposed to be in the co-main event at Bellator 214. Yet here he is, after Gegard Mousasi was forced out of the event. Taking on the always tough Henry Corrales, Pico is thrilled the share the card with a legend like Fedor. He said as much at Wednesday’s open workouts ahead of this weekend’s event in Los Angeles — but noted that in the end, it’s like any other fight. Beat the best to be the best, in other words. “I’m in a position to be the youngest world champion in history. Twenty-two years old,” he added. Of course, hitting such a high level at such a young age comes with its own unique set of dangers. Look no further than Jon Jones as an example of what not to do, at least outside the cage. So how would Pico avoid similar missteps? “That’s a good question, I haven’t been in that position but I can tell you one thing, my family will keep me in check,” Pico suggested. The embarrassment of being caught going out and doing something he shouldn’t, then going home and facing his grandparents, or his parents, would be a motivating factor to stay on the straight and narrow. “I wouldn’t want that shame upon me if I was to do something I wasn’t supposed to,” the young star said. There haven’t been since, and that streak of tough fights will continue on Saturday, January 26 at Bellator 214.